In Ceremonial Hall „Tone Peruško“ at Juraj Dobrila University of Pula, based on D’Basked project implementation, on 1st February held the Regional Conference: „Possible conections of formal and non – formal education“. The Conference was organized by The Foundation for Partnership and Civil Society Development, City of Pula – Pola, Elementary school „Veli Vrh“, Faculty of Educational Sciences Juraj Dobrila University of Pula and the Association of graduated students of Faculty of educational science in Pula. The Conference began by presenting the Erasmus+ programme, also D’Basket project, during which all present guests got the chance to hear children’s and teacher’s experiences shared during the project activities, educational programmes and pupils exchange. Project activities were presented by the teacher from „Veli Vrh“ elementary school – Marietta Kaić Kosanović, after what was a great chance for 40 children getting their Youthpass. The Conference was followed by the Panel discussion, in which there were presented different methods and approaches of education these days and in the future. The guests were: doc.dr.sc. Marina Diković from Faculty of educational science, the principal from Gymnasium – Pula Filip Zoričić, the principal of Elementary school „Vidikovac“ Predrag Dukić and Noel Šuran, the coordinator of institutionalization of local heritage schooling in Region of Istria. The discussion was guided by Vanesa Vitković Marčeta. The good practice examples, non-formal educational activities that started to implement were presented by Branka Antunović Piton from Mathematics society of Istria; pupils from „Vidikovac“ Elementary school – Luka Režem and Marko Tešija, along with professor Maja Kalebić: Museum experts from History Museum of Istria presented the „Hologram“ project; Aleksandra Žufić, IT technology teacher at „Veli Vrh“ Elementary school presented the cooperation of the private sector and IRIM association and through School of robotics; Noel Šuran presented the project of local heritage schooling in Region of Istria. During discussions, comments and questions, the conclusion is that the need for merging formal and non-formal education is huge, and there are numerous possibilities to do it. The interdisciplinary approach of processing different themes and approaches through several school subjects is a good learning method, and such activities are making a contribution to improving the curriculum and development of children’s personal skills. Different ways of learning, through interaction, play, teamwork, and creative approach is a good way for pupils to be in the center of the educational system. Except for the transferring of knowledge, the teachers and professors need to be moderators of the development by gathering different associates, including methods and opening approaches by stimulating children’s inclusion. There was also a lot of comment about the newest educational reform and there were also few misgivings about the logistic approach referring to the number of pupils in the classrooms, teaching in one-shift, school equipment, and the professors’ salaries. But, every comment during conference ended with the most important one, which is motivation and the commitment of the school staff for lifelong learning and development on the personal level, as well as in the professional pedagogical sense. Examples which are showed and are using is other schools are showing that the change is possible if there the teachers are motivated. 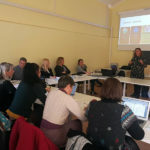 The workshop intended for teachers, professors, educational staff and student involved in D’Basket project, on which are presented and tested 4 different tools form D’Basket manual, was held in the afternoon. The special accent was given on the understatement of the need of developing changes in schools that need to prepare students for a lifelong learning and individual managing in increasingly changing society, which is according to educational reform that will start at academic year 2019/2020. The Conference was held within the project D’Basket, financed by the Erasmus+ programme, presented the tools and methods applicable in the educational process and the good practice examples that are successfully implementing in schooling with a goal for developing children skills implementing different innovative methods in the regular school system in order for knowledge improvement when it comes to entrepreneurship, multimedia, and tolerance. The launched theme will be continued, concluded the gathered guests and the participants.